The religion of the Mithras cult flourished in the Roman Empire from the first to the fourth centuries C.E., only disappearing with the triumph of Christianity. The primary source evidence for the cult, while not exactly scarce, is distinctly enigmatic, consisting of little more than iconographic images and some short, largely uninformative epigraphs. Thus the meaning of this mystery cult as a historical reality has remained, ironically, mysterious. In this essay, I will firstly review the primary source evidence, drawing upon the work of Manfred Clauss. I will then explore an interpretation put forward by Roger Beck based upon the symbolist theory of Clifford Geertz. I argue that Beck’s interpretation achieves a greater insight into the experience and meaning of the cult largely because he takes the trouble to interpret the data in an appropriately ‘religious’ fashion. As we shall see, studying the Mithras cult will not exactly ‘teach us a lesson’ but ‘open out the possibilities’ of religious experience. Since this presumably approximates the goal of the ancient cult-members, we shall see how interpretations based on strict scientific rationalism will be unilluminating and generally inappropriate. 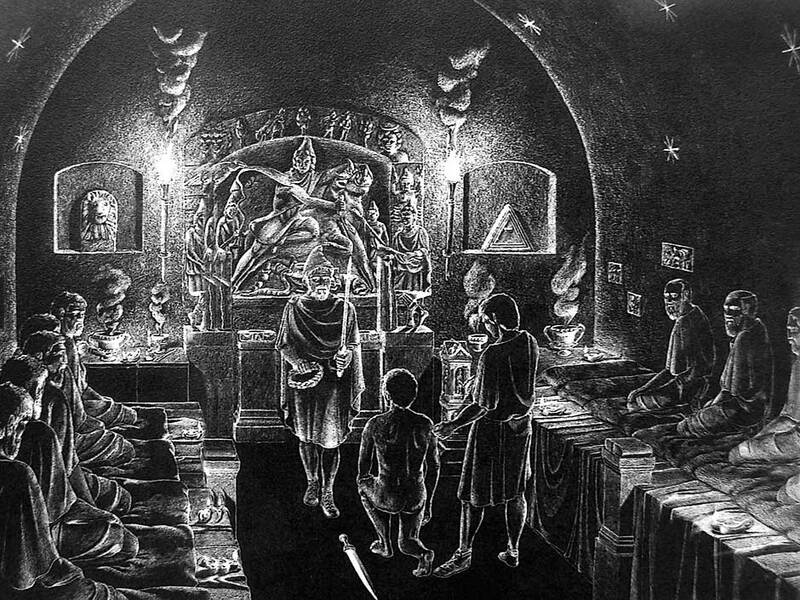 The Mithras cult apparently emerged during the first century C.E. with the appearance of the first inscriptions and artefacts. The area of spread is very large, with Mithraic sites discovered throughout the ancient empire from Egypt to England. We only know about membership from short epigraphs, for example: “To the invincible god Mithras, Optimus, deputy of Vitalis, slave of Sabinius Veranus and supervisor of the customs-post, has fulfilled his vow.” Early followers included soldiers, ordinary citizens, slaves and low-grade administration officials. Scholars have long believed that the cult admitted no women, but Griffith remarks that one textual reference is difficult to explain, from Porphyry of Tyre, the third century C.E. Neoplatonic philosopher, who wrote: “Thus initiates who take part in their rites [the Mithraic Mysteries] are called lions, and women hyenas, and servants ravens” (Porphyry, De Abstinentia ab esu animalium 4.16.3). 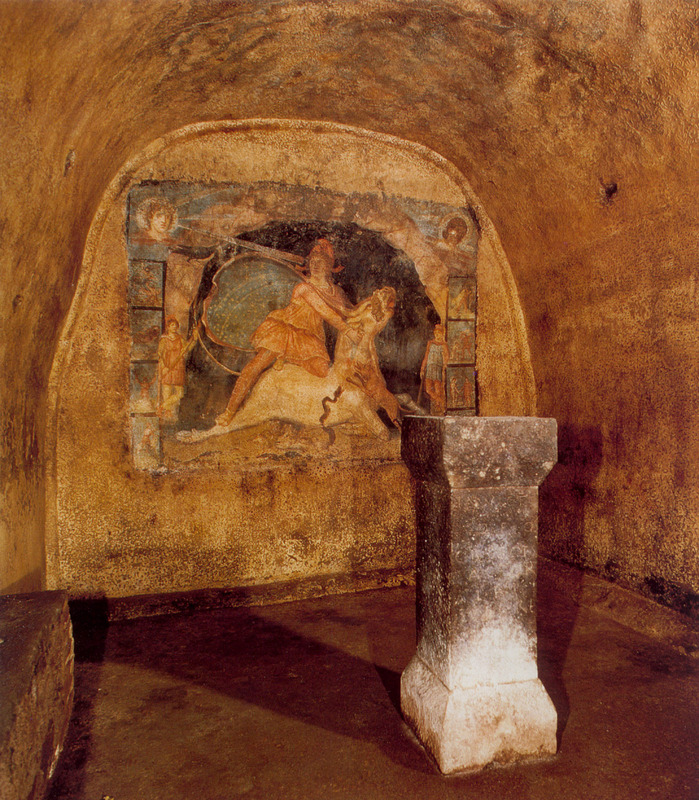 A recreation of the interior of a Mithraeum. Everything else we know about Mithraism comes from the physical artefacts and iconography usually discovered in the ruins of Mithraic temples. A mithraeum is a small, square-sided room, usually less than 10 metres along any wall. A cave-like interior appears to have been important; mithraea tend to have vaulted ceilings – some were even carved out of rock. The basic common structure is a central aisle, flanked by raised podia on each side, upon which cult-follows presumably sat or reclined. The exact range of images, statues and small altars varies from site to site, but every mithraeum had a brightly painted cult-image of Mithras slaying the bull displayed at the end of the aisle either in bas-relief or, sometimes, as a free-standing sculpture. Apparently, lighting effects were also important, with many lamps discovered in the ruins; some images had alcoves for candles, designed so that they could be made to glow in the darkness of the Mithraic ‘cave’. A typical image of Mithras. shown firing an arrow at a rock, which magically brings forth water. A series of images portray his hunting a great bull – he is shown prowling, chasing, riding, guiding, dragging and even carrying the bull on his shoulders. This presumably leads to the scene that forms the central cult-image of the bull-slaying (tauroctony): Mithras is shown holding down the bull with his left knee and plunging a dagger into its neck with his right hand while fixing the viewer with an expression of “easy grace” or “dolor and compassion.” He is almost always accompanied in this act by a dog, a scorpion and a snake, and sometimes a lion, all of whom seem to be feeding upon the bull, whose thrashing tail or gushing blood is often represented as burgeoning grain-stalks. These creatures frequently take part as observers of the earlier scenes too, appearing along with images of the sun and moon, a distinctive krater (mixing bowl), the Roman sun-god Sol, and the mythic torchbearers Cautes and Cautopates. The mosaic floor at the Mithraeum of Felicissimus at Ostia. Rarely are initiations portrayed and these are difficult to interpret. Some written sources suggest the rituals were very harsh but these herald from Christian writers who obviously disapproved of the cult and almost certainly were exaggerating. A lot of the theories concerning initiation have centred around the apparent 7-stage grade structure for cult-members. The lowest grade was called Raven, and progressed upward through Bridegroom, Soldier, Lion, Persian, Sun-runner, and Father. 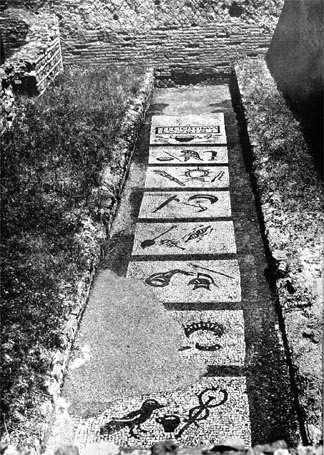 These grades are attested by iconography at a few mithraeum sites, such as the mosaic floor at the Mithraeum of Felicissimus at Ostia near Rome. Some scholars consider the grades to be ubiquitous to the cult, while others suggest they only applied in certain areas, or only to priests. Clauss represents the scholarly consensus when he affirms that the Mithraic cult images are difficult to interpret, that we may never know exactly what they signify, but that the tauroctony, for instance, generally gives the impression of a positive, life-affirmation. 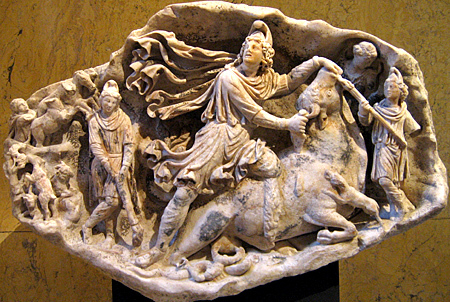 Mithras’ central act of killing the bull is a “transfiguration and transformation” or rebirth, not merely a scene of senseless slaughter and destruction. In terms of understanding ancient mystery religions generally, Clauss exhibits an awareness that ancient peoples did not feel bound by fixed credos, and that they could worship multiple gods without conflict or contradiction. 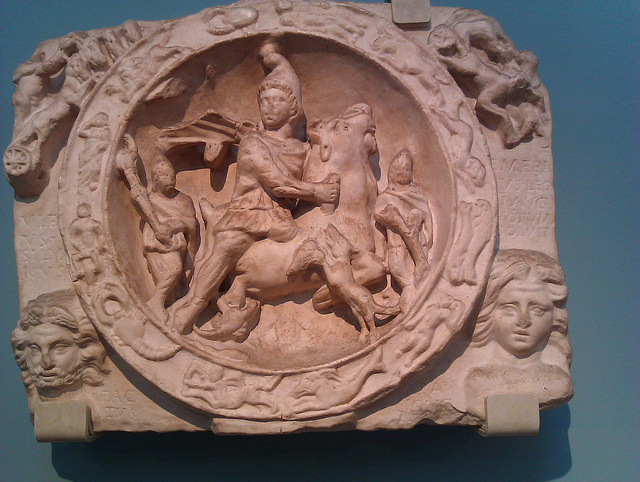 However, he still finds the Mithras cult rather disorganised or not properly unified, exemplified by the evident inconsistency of iconographic detail and style, lack of evidence of a definite doctrine, the confusing syncretism of gods and symbols, and its ultimate weakness in the face of attacks by Christians. Undeniably, the small, dark Mithraic temples and the paucity of written description has led to assessments of the Mithras cult as deeply esoteric. This has led to all kinds of theories as to the type of esoteric meaning suggested by the iconography. Many scholars have drawn on perceived links between the Mithraic imagery and astrology, in particular, proposing that Mithraic ritual was somehow supposed to lead the participant on a journey through the stars to experience the soul’s salvation. Clauss is very dismissive of such interpretations, but others have provided complex arguments for Mithras’ identity with the sky or the cosmos itself (Weiss), for the tauroctony as a kind of astral clock (North), or as encoding the mathematics of equinoctial precession (Ulansey). Roger Beck argues that links to astrology do seem justified but many interpretations approach the subject wrongly; there is an ad hoc nature to many interpretations which is disconcerting, inviting inconclusive readings. Essentially, Beck argues that we are not missing a definitive interpretation; we lack a sensible theoretic for understanding the multiplicity of existing interpretations. The missing theoretic, Beck argues, concerns the appropriate interpretation of mythic symbols. Clifford Geertz suggests, for instance, that applying the principles of logic – discreteness, linearity, exclusivity – is not appropriate for the interpretation of symbolic subject matter. All religious systems are characterised principally by an emotional element; the intellect only provides assent to a feeling-toned worldview. Geertz argues that religion comprises a worldview and an ethos which interact, forming a ‘gestalt’ which establishes a fundamental sense of numinous meaning and experienced reality, only secondarily converted into an ethics or consistent metaphysics. Beck similarly argues that Mithraism, as a feeling-toned system, cannot have a definitive meaning, like a dictionary definition. Emotional experience comprises an ineffable complexity, not a specific symbol-to-meaning correspondence. A particular symbol usually means many different things depending on the level of interpretative experience. Thus, interpretations which involve complex intellectual workings or instrumental answers have no place in the theoretic. Hence, the Mithraic symbology is unlikely to be a complex code, which, once decoded, reveals the mathematics of astral precession. This not only draws upon incongruous modern astronomy, but such thinking exemplifies a theory of religion which suggests that only the learned can understand religious symbols, which the vulgar misinterpret. This idea is often propagated by ancient intellectuals, such as Porphyry, but it is nonetheless unrealistic, or at least, peripheral to our concerns. Beck suggests we must focus upon the experience of the Mithraic majority, who were unlikely to be attending a secret astronomy class. A Tauroctony within a circle suggesting the zodiac. The Mithraic symbols are not trying to hide their meanings – Beck suggests that what you see is what you get. Mithras, as a sun-god, probably represents the sun on the primary level of interpretation. Granting that the cult-followers wanted to keep their religion mysterious, the iconography is already ‘hidden’ inside the mithraeum – there was no need for further opacity. Scholars seem to forget this context, which is ironic considering the usual importance of provenance for archaeological explication. Beck argues that the tauroctony alone has no context – the symbols could be interpreted ad infinitum. We must start with what the mithraeum means, within which the tauroctony resides. Furthermore, we must also extend our context into the common, generally understood cultural-social milieu of the Roman Empire in this period, for, as per Geertz’s theory, it is ethos and worldview which will inform contemporary symbolic understanding. This passage is often dismissed by scholars as it is written by a Neoplatonist philosopher not a Mithraic cult-member, yet, as Beck argues, Porphyry’s essay is not about interpreting Mithraism – the cult merely earns an incidental mention. Furthermore, as per the theoretic, the allusion does not need to be exactly correct; we are not looking for exact correspondences, only a general impression of ethos. This passage suggests not only that there was a popular understanding of the mithraeum as ‘cosmos’, but it also specifies the pertinent symbolist way of thinking. Thus, deferring again to the cultural milieu, Beck next asks how Roman society conceived of the cosmos. Clauss knows the answer as well as anyone: he writes of the well-known cosmology of Aristotle, with the unmoving Earth at the centre of seven invisible spheres, one inside the other, each hosting a visible ‘planet’ – Moon, Mercury, Venus, Sun, Mars, Jupiter and Saturn. 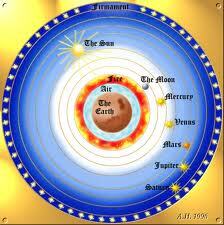 The human soul was believed to descend through these spheres to be born. The question is whether something like this cosmological worldview is symbolised in the mithraeum and its iconography. Beck responds with a resounding ‘yes’: the mithraeum is a dark cave-like room, rather like the vault of the stars, in which strange lighting effects illuminate representations of sun, moon and stars, and a seven-grade system mirrors the seven celestial spheres. To explain the animals and other iconography, we need only expand on the popular Greco-Roman symbolic associations between the planets, the gods and their mythic narratives. The tauroctony does not merely picture a man slaying a bull; it portrays a man slaying a bull, accompanied by a scorpion, a dog, a snake, and sometimes a lion and a bowl – all of which were ancient and well-known representations of constellations in the zodiac. Some similar astral revelation may have furnished the Mithraic cult-followers, through ritual of some kind, with an experience of “the path by which souls descend and go back again” (Porphyry, On the Cave of Nymphs 6). The Mysteries of Mithras provide us with an interpretative challenge – what to make of an ancient religion about which we have very little textual evidence. Using logical deduction and the usual archaeological methods we can make interpretive guesses, but what emerges is a vague, ad hoc set of symbolic elaborations. The symbolist theoretic of Geertz and Beck does not enhance our viewpoint by disclosing new archaeological facts or even new symbolic interpretations, but provides an insight into the religious mindset that ordered and experienced such meanings. I believe this is what the Mithras cult can teach us today – its symbolic iconography exemplifies the manner in which mythic thought can be (usually is) structured. To comprehend this, we must acknowledge the importance of not just physical but cultural provenance when interpreting ancient myth and religion. From the symbolist theoretic, we can garner a greater understanding not just of the Mithras cult but of the typical human religious worldview, a perspective often buried, confused, or considered ‘esoteric’ in the usual positivist rational analysis of the twentieth-century scientist and archaeologist. Beck, R. 2000. “Ritual, Myth, Doctrine, and Initiation in the Mysteries of Mithras: New Evidence from a Cult Vessel.” The Journal of Roman Studies 90: 145-80. Campbell, J. 1991. Reprint. Occidental Mythology. New York: Arkana. Original edition, New York: Viking Penguin, 1964. Campbell, J. 2002. The Inner Reaches of Outer Space. Novato, California: New World Library. Clauss, M. 2000. The Roman Cult of Mithras. Translated by Richard Gordon. Edinburgh, Edinburgh University Press. David, J. 2000. “The Exclusion of Women in the Mithraic Mysteries: Ancient or Modern?” Numen 47: 121-41. Geertz, C. 1957. “Ethos, World-View and the Analysis of Sacred Symbols.” The Antioch Review 17: 421-37. Gordon, R. L. 1980. 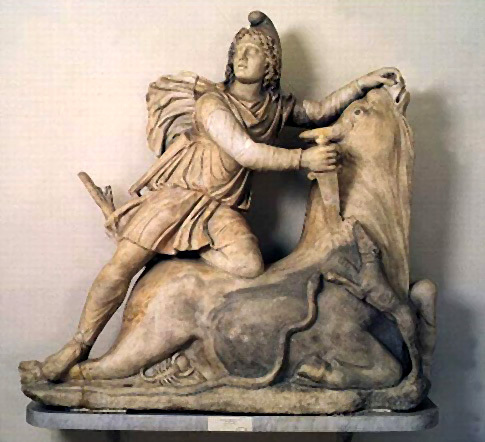 “Reality, Evocation and Boundary in the Mysteries of Mithras.” Journal of Mithraic Studies 3: 19-99. Griffith, A. B. 2006. “Completing the Picture: Women and the Female Principle in the Mithraic Cult.” Numen 53: 48-77. This translation from Clauss 2000, 38. Clauss 2000, 33; David 2000, 129, 131, 138-9; Griffith 2006, 65. Translated by G. Clark, quoted in Griffith 2006, 51. Campbell 1991, 258, after Cumont. Clauss 2000, 102; Beck 2000, 146 n. 10. Clauss 2000, 9-10, 14, 148, 158. All these referenced in Beck 2006, 37-8. Beck 2006, 72; Clauss 2000, 25. Gordon 1980, 22-3; Beck 2006, 27. Quoted in Beck 2006, 102. Clauss 2000, 10-11; Beck 2006, 77; Campbell 1991, 255. Beck 2006, 79-80; Campbell 1991, 255. Note: all primary sources were referenced from inside secondary sources so all works cited are secondary.